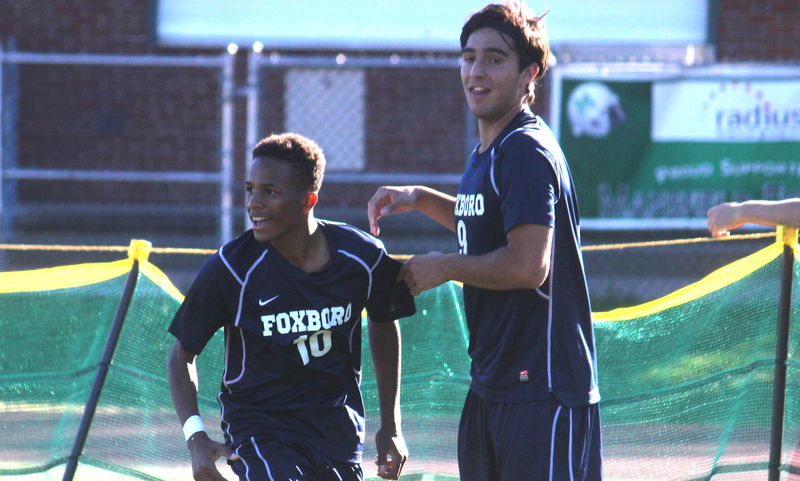 Foxboro scored a ridiculous 70 goals a season ago and senior striker Anthony Barreira was a big part of that. Although the Warriors lost Devante Teixeira and Joe Morrison, the other two big pieces to Foxboro’s offense, defense shouldn’t rest on their laurels when playing Barreira and Foxboro season. 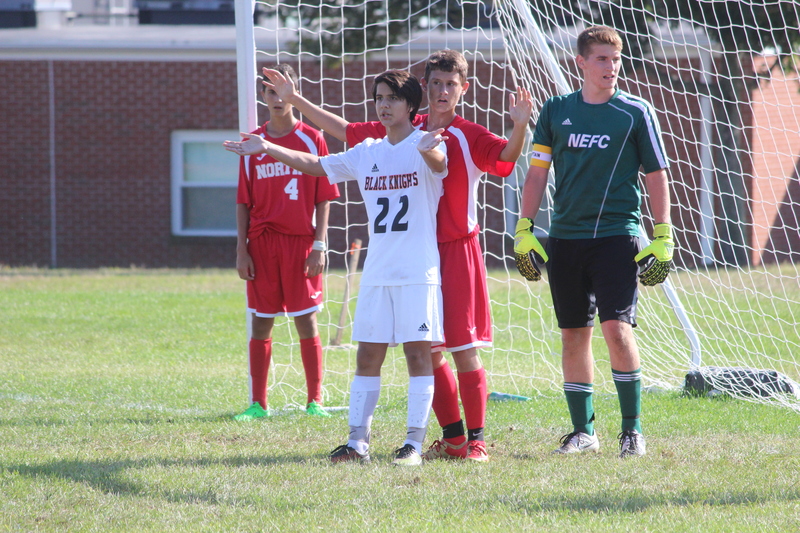 Barreira has been finding the back of the net against Hockomock defenses since he was a freshman and that’s likely to continue in 2016. He’s good with the ball at his feet but one of his biggest strengths is to get free off the ball. He can find the right spot and is able to finish off crosses in a variety of ways. With the ball at his feet, he can play with back to goal or take defenders on one on one. If he’s given a bit of space around the area, he can finish with the best in the state. The Panthers have a lot of new pieces in the lineup this season but Hatim Brahimi’s presence in the midfield will help make that transition easier. Speaking of transition, Brahimi is one of the best in helping a team move from defense into an attack. He’s solid with the ball at his feet and is able to spring teammates into open space. If a teammate is making a run into the final third, expect Brahimi to be able to deliver, whether it be on the ground or in the air, and even in the tightest of spaces. He’s confident with the ball at his feet and takes his time in the midfield, without forcing things. In the final third, Brahimi can be a tough to deal with because of his ability to find teammates or finish himself. The 2015 HockomockSports.com Underclassman of the Year Nathaniel Cardoza really emerged onto the Hockomock scene during last year’s season and then opened even more eyes across the state during the Tigers’ playoff run. 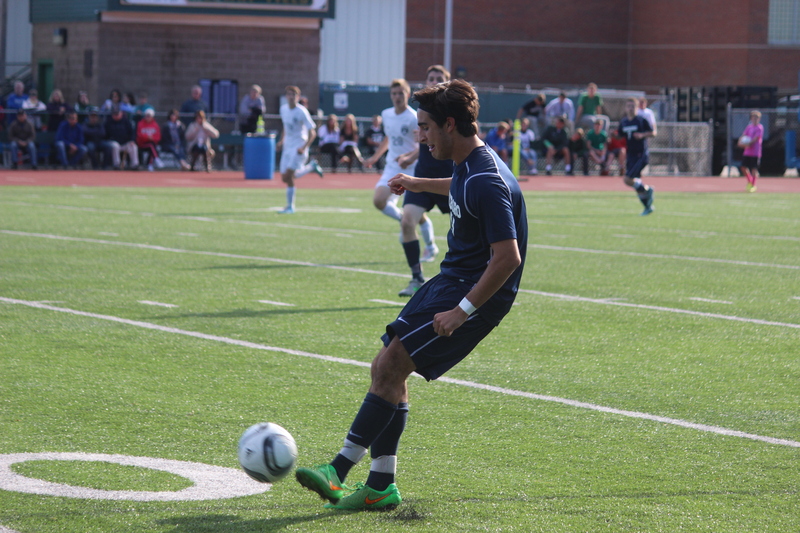 Cardoza is a two-way center midfielder that really played a role in OA’s offense and defense a season ago. Defensively, he’s able to mark well and anticipate well, often coming away with the ball in one on one situations or intercepting passes. He showed the ability last year to then take the ball and get it up field into the attack quickly. Whether it was getting the ball wide or feeding a through ball up top, his vision was apparent. In the final third, his finishing ability only got stronger as his confidence level grew. He will be a vital piece as Oliver Ames attempts to find success in the Kelley-Rex this season. Not many defenders in the Hockomock League turned as many heads as Stoughton’s Goddy Fombe did last year. Head coach Aaron Salter moved some pieces around and Fombe’s switch to center back proved to be a brilliant one. 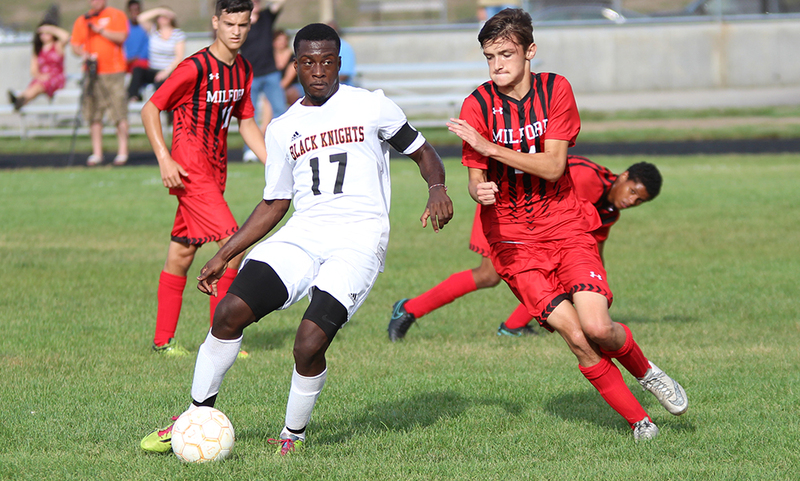 Fombe shined as a center back, bringing a calming presence to the Black Knights’ back line. Center backs have to deal with services both from set pieces and in the run of play and Fombe was able to do so, helping to keep Stoughton in games. Stoughton was able to keep possession at times because of their ability to play from the back. Instead of just clearing it out, Fombe was comfortable with the ball at his feet and would distribute from there. Stoughton is a favorite in the Davenport this season and Fombe is a big reason why. Over the past couple of seasons, Max Gurnon has been the standard for center backs, and defenders in general. Mansfield’s defense has been very well organized in the past couple of seasons thanks in large part to Gurnon. At the high school level, having an organized, stable back four can go a long way. Not only can Gurnon defend well in the air against crosses and throw ins, he’s an attacking threat on the other end off of set pieces. He showed last year he can rise above defenders and get his head onto the ball to finish. On the ground, Gurnon does well to keep possession for the Hornets and has strong distribution skills. Mansfield was hard to score on a season ago and with Gurnon and two other defensive starters returning this year, it will be a tough task for teams again in 2016. Harry Lancaster has been making plays for Attleboro for the past three years and that won’t be changing for his senior year. Lancaster has been a jack of all trades for head coach Peter Pereira in his time, starting as an outside mid before transition to the middle of the pitch. He saw time as a striker as well but now will be a vital part of the Bombardiers’ defense. He’s showed off his ability to take players on one on one and now will be tasked with stopping them. He’s got a high soccer IQ, which will allow him to help the Bombardiers start their attack from the back. He’s strong with the ball at his feet and should add a lot of experience to Attleboro’s defense this season. During his sophomore season, Tyler Mann really turned some heads with his attacking presence and finishing ability. He possesses a really strong first touch, which is a tremendous asset to have, especially in the final third. He’s deceptively good in the air, which is tough for defenses when they have to mark defender Cam Mullins. Mann can play with his back to goal and can hold the ball up while the attack gets going, or he can run into space and run onto a pass. With the ball at his feet, he can be tough to stop and when he is near the area, he’s one you don’t want to give much space to or he’ll make you pay. Oliver Ames had the second most goals scored a year ago and striker Thomas McCormick was a big reason why. McCormick scored six goals in the regular season and added nine assists. McCormick is an absolute pest for defenders to deal with, and we mean that in a positive way. He moves very well off the ball, which can make it difficult for defenses to keep track of him. He has a knack for finding the ball at the right times, especially inside of the area. Oliver Ames is known for its dangerous set pieces and McCormick is either the play maker himself or the one who finds the back of the net. If you had to pick one player in the Hockomock League to describe as a ‘field general,’ Mullins would be a top candidate. Even as a center back, Mullins is a vocal leader that helps the Warriors keep shape from front to back. Defensively, teams have a hard time scoring through the air due in large part to Mullins’ marking and aerial wins. On the flip side, Mullins is a big target on offense when it comes to set pieces and long throw ins. His presence in the area also frees up other players. Mullins is a no-nonsense defender, making it hard for defenses to penetrate, especially up the middle. He has a good physical presence so opposing teams aren’t able to dominate on the attack. Mullins is one reason that King Philip is a dark horse for the Kelley-Rex title this season. A year ago at this time, not many people around the league knew much about then-freshman Fabio Ponce De Leon. Now, just about the whole league knows who he is and what he adds to Stoughton. Ponce De Leon really emerged as a true scoring threat last year, finishing with a team-high eight goals. The crazy thing is, he could have even more if he had a couple of bounces go his way. He showed a high level of confidence during his rookie year, especially with the ball at his feet. Whether he was in the center of the pitch or pushed out wide, he had no problem taking on defenders. He can beat a defender one on one, or he can use his vision to find an open teammate. Although defenses will be more alert to Ponce De Leon this year, we expect him to be a top offensive player in the league.